SUMMARY: Seventeen-year old Addie is faced with a difficult decision when her parents announce their separation. Forced to choose which parent to live with, Addie uses her ability to "search" her own future to determine which choice she likes best. Told in chapters that alternate between Addie's potential life inside the "para" compound where she grew up in and her potential life among the "norms" in Dallas, Texas. 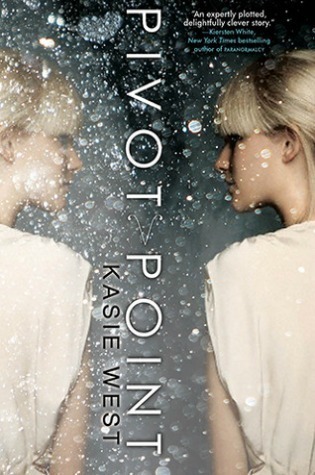 WHAT I LIKED: Pivot Point is one cool concept. In today's super-saturated paranormal YA market, it is getting harder and harder for authors to produce something unique and special. Kasie West has definitely done that with Pivot Point. The story centers on seventeen-year old Addie, who has lived with her parents inside a compound her entire life. The compound conceals the paras, people who use a higher percentage of their brains than normal humans. Because they maximize their brain output, the paras have developed supernatural abilities such as telekinesis, mood control, clairvoyance, lie detection, persuasion, memory erasing, etc. Addie's ability is clairvoyance, which allows her to search her own future when she is faced with a choice, the "pivot point." I love the way Addie's story is told through her search of her own future. She searches the next six weeks, where Addie lives out two very different lives: one with her mother inside the compound and one with her father outside the compound. The chapters alternate between Addie's "para" life and her "norm" life. It's kind of a time-travel story, except the whole thing takes place in about five minutes and Addie never actually leaves her own room. Two mysteries play out within both possible futures. Both mysteries involve Addie and the people she knows and meets, and Addie's choice of where to live directly affects the outcome of both mysteries. Though there are some loose ends left over for the sequel, readers will know Addie's choice by the end. I mention that because I was worried as I read that I would not find that out and would have to wait for the sequel. You won't have to wait, and I am really glad for that. I don't think I would have liked this as much if Addie's choice were dragged out that way. WHAT I DIDN'T LIKE: The obsession with football. It probably doesn't help that I live in Texas, and the football obsession here is so overly disproportionate to many people's interest in, say, education. Even though Addie is not a football fan, the sport is a huge part of both of Addie's futures. The football obsession is realistic, but it (and football player Douche Duke) kept me endlessly rolling my eyes. The murder mystery seemed too-easily resolved in the end. I won't say more than that, but I was irritated a particular person's uncharacteristic and sudden attack of conscience. THE BOTTOM LINE: Unique and fun. I will definitely be reading the sequel. STATUS IN MY LIBRARY: We have it. This will be crazy-easy for me to booktalk, so I expect circulation to increase considerably for this title. I've already ordered two more copies in anticipation of lots of hold requests from my students. I LOVED this book! I like that it pointed out the football worship here (it is honestly a huge dilemma, living in Texas). I wish the book had touched on more Dallas culture instead of focusing straight on football.